US Secretary of State John Kerry said on Friday that a peace deal could be imminent as he wrapped up his Israel visit, according to an AFP report. “I believe we are closer than we have been in years to bringing about the peace and the prosperity and the security that all of the people of this region deserve,” he told reporters traveling with his delegation at Ben Gurion airport. The news follows reports from Maariv that negotiations were improving Thursday, as Kerry indicated that the US was more willing to follow Israel’s stance on its security – specifically the crucial Jordan Valley region – after multiple refusals to cooperate by Palestinian Authority (PA) Chairman Mahmoud Abbas. Abbas reportedly refused every proposal by the US Security council, leading Kerry back to more talks with Prime Minister Binyamin Netanyahu to reach a reasonable compromise about the issue. Kerry’s visit marks the latest in a series of efforts by the US to broker more peace talks between Israel and the Palestinian Authority. Earlier this week, US sources revealed that the delegation sent to Jerusalem included General John Allen, who was set to present a security plan for the region based on the US’s analysis of Israel’s security risks. In response, Deputy Defense Minister Danny Danon made clear that Israel would not accept a compromise on Israel’s safety. 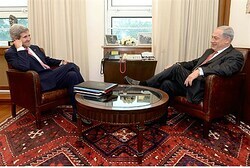 On Thursday, Kerry stated, “The bond between the United States and Israel is unbreakable. And while occasionally we might have a difference of a tactical measure, we do not have a difference about the fundamental strategy that we both seek with respect to the security of Israel and the long-term peace of this region. “We will continue to work for that. “I thank my many Israel friends for their embrace and for their patience as we pursue this complicated process,” he concluded.